APIA (Samoa Observer / Pacific Media Watch): Three female reporters from the Samoa Observer were threatened and one was assaulted in the presence of three police officers, when covering a traffic incident this week. The reporters are Sarai Ripine, Nicola Hazelman-Siona and Lanuaola Tupufia, who is a Pacific journalism graduate from AUT University. 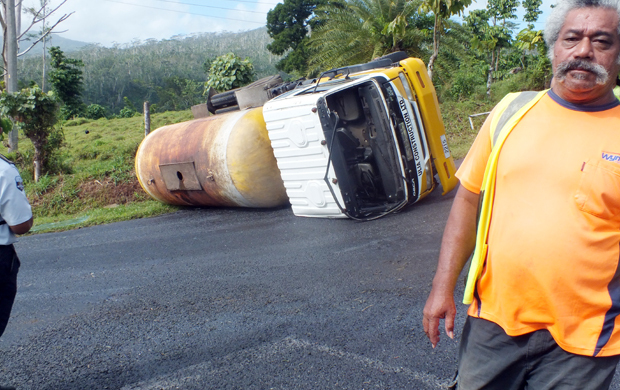 A truck with a tanker on its back tipped over on Wednesday in the village of Vailima, approximately 4km south of the capital Apia. Two of the reporters were taking photos of the truck when a man walked over and told them to stop. “Hand over the camera and delete the photos,” he shouted at the reporters but they refused. The other reporter, by that time, had walked towards their car to get her camera. She had picked up her camera, walked outside and was taking photos of the truck, when she saw the man walk towards her. She then went inside their car, and by that time the man had reached the car, and he asked her: “Have you taken a photo?” “Yes,” the reporter said. He then demanded: “Take the photo out of the camera.” The reporter did nothing. That was when the man reached inside the car through its opened door, grabbed her on her arm as he was trying to wrestle the camera from her with his other hand, and a tug-of-war began. In an interview with Radio New Zealand International's Alex Perrottet not long after the report emerged, Prime Minister Tuilaepa Sailele Malielegaoi spoke about media freedom in Samoa. Perrottet says the Prime Minister had not heard about the accident, but gave a glowing report of the safety of media personnel in Samoa, despite the attack. Tuilaepa told Perrottet that he spoke with the media two or three times a week and got on very well with all media, unlike the leaders of other Pacific nations. He said Samoa had the safest and the freest media in the Pacific. According to the latest Press Freedom Index, Samoa has the second freest media in the Pacific. Samoa is ranked 48th worldwide, up six places from the 2012 index. The media freedom in the Polynesian country is categorised as "satisfactory" by the NGO Reporters Without Borders, which compiles the annual reports on media freedom. Apart from New Zealand (8) and Australia (26), Papua New Guinea (41) is the only other Pacific country ranked above Samoa. After the accident, one of the Samoa Observer reporters told the man she would lodge a complaint of assault against him with the police. To which the man said: “Why don’t you make your complaint with the police officers here?”, reported the Samoa Observer. None of the police officers intervened throughout the confrontation, the newspaper reported. “Mose” was told: “We are just doing our job. Our job is to inform the public about what is happening in their country.” “Mose” said nothing and walked away. Attempts by the Samoa Observer to get a comment from Assistant Police Commissioner Fauono Talalelei Tapu on Wednesday were unsuccessful.